My name is Ethan, and I live in Arizona. I’m a 7th grader. I play soccer, swim, snowboard, an d play video games. I play on the Wii and online. I like a website that is called Minecraft, in Minecraft you can mine or build stuff. Math is my favorite subject at school. I like reading for fun. I will mainly blog about things I’m thinking about. My posts will give you tips on games, books, learning, and life. I got the Minecraft photo from Post-apocalyptic research institute and it is Some rights reserved, the website I got it from was Flickr CC. My mom took the picture of me . Nice job, Ethan! My favorite subject is math as well. Keep up the good work! Thank you for the compliment. Do you like to read? I just finished a series that is called “Island“. Hi I am Clarissa. Your blog is interesting. 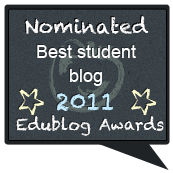 Congratulations on winning the Nominated Best Student Blog of 2011. My teacher recommended me to see your blog. I’m very glad I did. Thanks for visiting my blog. Thank you for the compliment. I really like Mrs.Hamman’s blog. What is your most favorite thing to do in Mrs. Hamman’s Class. I love the technology. We are doing a project called Disney Planet Challenge and it’s solar, with the money we save we give it to people who give solar ovens to refugee’s and I was the one to think about it. Thanks for registering for the March 2012 student blogging challenge. Make sure you visit the blog every week beginning early March, when the first challenge will be published. If you want a reminder sent to your email each week, use the “Subscribe by email” on the right sidebar of the blog. Also make sure you visit blogs from other students around the world with similar interests. PS Have you been following Davo and Squirrel on their trips? My favorite subject is also math. I like playing soccer and video games too! I have five questions for you though. What is the name of your town? What’s your favorite food place from your country? What’s the name of your school? How big do you think your school is? How big is your town? Well those are the five questions I had for you. I live in the Phoenix, AZ area. My restaurant’s are: Benihana, Paradise Bakery, Tropical Smoothie. I can’t give away what my school name is. My school is about 400 students. Phoenix is very large, my town is very small. I’m very sorry that I wasn’t able to reply sooner. Your blog is cool~ and I even like to swim in the water. What is your favorite type of math and what food are going to eat on the last photo. We must have alot in commen. I like to swim and play minecraft too. This is a great blog! It’s a nice space to add your thoughts and questions and have a group of people young and old reading, answering, and helping you out. I hope you continue to add to your blog! I was chatting with your mom on a Google Hangout and she gave us the link to your blog. You are very thoughtful and creative! I wish you the best in 6th grade! Thank you for complimenting, coming to my blog, also for complimenting me. I’m having a great time in 6th Grade. I am a teacher of seventeen fifth graders who each have their own blogs. I found your blog through the Edudemic contest and I admired how you shared your interests in video games, sports, and good websites. 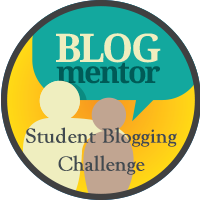 Your blog is one of four I found as a mentor blog for my students to be like. It would be great if you left a comment with 1 or 2 of the students who share a similar interest as yourself. Further, if your school would like to setup a digital buddy class system, I can speak with your teachers. They can reach me through our site. Our school uses the American curriculum and come from 50+ countries. Keep up the great work Ethan! Math is my favorite subject also. I have a question, why do you like reading for fun? I am a 10 year old boy and live in Canada. I REALLY like your blog. I also play minecraft. and Math is my favourite subject too. We read your blog in class. We liked the free rice website. Some of your posts are very interesting, we like the fact that you always take time to reply to people’s comments. I am a teacher-librarian in a secondary school (Years 7–12) in a suburb in Sydney, New South Wales, Australia. I am very impressed with your blog and with the class blog your teacher has set up. Learning is such fun, isn’t it? So is travel! Like your teacher, I have been to many places. I have travelled within Australia and overseas. These are some of the overseas places I have visited (some on several occasions): Auckland, Christchurch, Dunedin, Invercargill (New Zealand); London, York, Edinburgh, Isle of Skye, Glasgow, Aberdeen, Crail (United Kingdom); Paris (France); Florence, Venice (Italy); Helsinki, Roveniemi (Finland); Hammerfest, Bergen, Karasjok (Norway); Bonn (Germany); Vienna (Austria); Prague (Czech Republic); Budapest (Hungary); Amsterdam (Netherlands), where I sat and cried in the Anne Frank House. I once visited San Francisco and Denver and San Diego (United States), but have no plans to return. I go to Singapore fairly frequently because my eldest daughter lives there. Other places in Asia I have visited are Hong Kong, Bangkok, Shanghai and Guangzhou. What is your favourite activity? Do you dream of travel? (I am addicted to it!) One day, perhaps, you will come to Australia, which has some amazing places (like Uluru). Most Australians live in big cities near the coast. The interior is vast and sparsely populated. Last year, I travelled to Perth, in the state of Western Australia (which is about three times the size of Texas). Perth is the most isolated capital city in the world. The plane ride from Sydney takes 5 hours–whereas going to Auckland in New Zealand takes only 3 hours! I really liked the way you set out your information. Some of your post are very interesting. I learnt a lot. 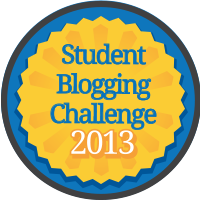 Thanks for registering for the March 2013 blogging challenge. Make sure you visit the blog every week starting 3rd March, when the first challenge is published. If you want a reminder sent to your email each week, use the “Subscribe by email” on the right sidebar of the blog. Also make sure you visit blogs from other students around the world with similar interests. PS Pleased to have you as a mentor as well. Hey, nice blog! I notice you like games (esp. Minecraft) and Math. We’re building a 3-D math game where you can design your own weapons, enemies, and levels, and play with mathematics (no worksheet problems — it’s all shooting things and casting spells.) You should check it out! I think that I would really like that game form the description that you gave me. The next time that I can get onto the computer I will check it out.